One of the most satisfying products that we manufacture are Custom Jacquard Knit Beanies. They are 100% made in the U.S.A. and are custom knit right here in New Jersey from Yarn To Beanie and Yarn To Scarf. Since we don’t rely on other manufacturers we can create your custom color and logo beanie in any color combination and style that you would like. As the direct manufacturer of these custom knit beanies, we can make from just one beanie to thousands, depending on your requirements. Since we don’t have to wait on anything from over seas, we can deliver your custom knit beanie order in just a few days. Our beanies and scarfs are custom knit from yarn to finished beanie or scarf in our facility in New Jersey. In addition to manufacturing custom jacquard knit beanies, we also manufacture jacquard knit scarfs. 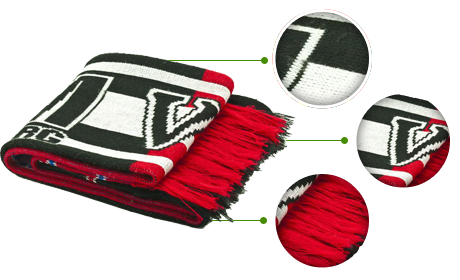 As the direct manufacturer of scarfs, we offer custom designs in various colors, various lengths and with the option of multiple color fringe. Like our knit beanies, our custom knit scarfs are manufactured in our Flemington, NJ anufacturing facility. We knit from yarn to beanie and yarn to scarf right here in the U.S.A.